The best looking diary/journal app for iOS. A dozen retina-grade themes with rich textures and 3D page turn effects. 14 scalable fonts. Full-screen zoomable images and maps. Your whole day is here. With pictures and maps too. Never forget a day. Your Tweets, Facebook Status updates, iCal events, photos, videos, blog posts - they're all automatically included in each day's entry. Items with GPS data show up on a map. Now you can take your life with you. 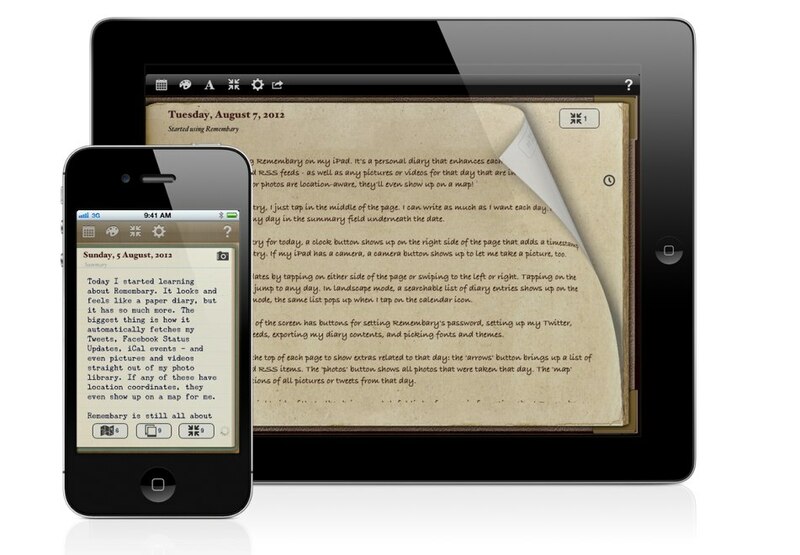 The best diary app on the iPad is now also on the iPhone and iPod Touch. Export/Import your diary with DropBox to share with all of your devices. Find out more about Remembary. REMEMBARY 2 IS NOW IN THE APP STORE! See what's new in Remembary 2. See what the new Remembary looks like. Watch the video below!